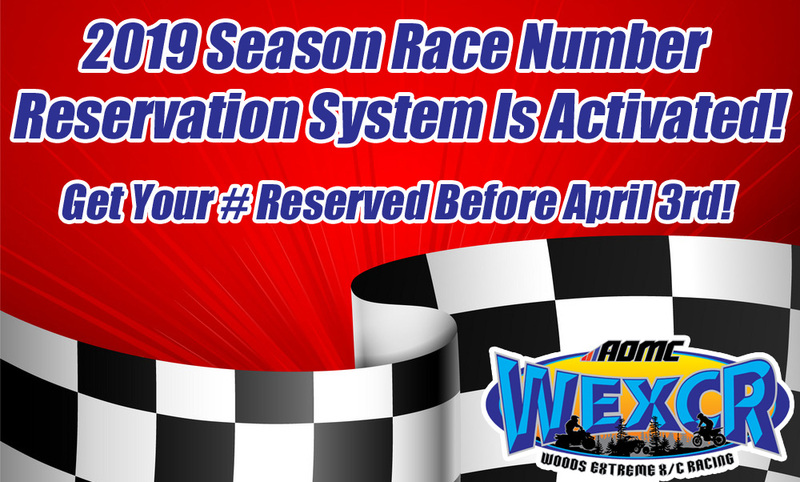 The start of our 2019 race season is just right around the corner and we now have our online number reservation system activated online! Get your number reserved before the deadline of April 3rd, after that the reservation system will be closed and numbers will be issued on a “first come, first serve basis” on each race day. Please take a couple minutes and read this page thoroughly then at the bottom of this page click on the “Online Number Reservation” link to pre-enter your information into our registration database as well as to reserve your race # for the 2019 season. This will greatly help speed up the registration process @ the yellow trailer on race day. It is not mandatory, but it is very helpful to pick the number that you run on your race machines number plates. Before starting your request make sure you checkout our available classes for the 2019 season & class rules to see this seasons class selections as we have made some revisions. Please review those pages to make sure you are entering the correct class when entering your information. When choosing your class for the 2019 race season please make sure you honestly choose the class according to your skill level, sandbagging in any class will not be tolerated at all. Everyone should be racing the same skill level based class no matter what series it is that you attend or no matter if the event is AMA sanctioned or not and no matter how many racers may attend a series. When completing your request make sure you follow the instructions and complete ALL information fields, including emergency contact info, any requests with just partial info will be deleted. If you submit a request with partial info and you provided us with a valid email, you will receive an email stating that you must resubmit your request with full info which could cause you to lose your number if another racer is requesting the same number. Also when reserving your numbers, you must give us 3 different choices on the numbers that you would like, numbers can only be 3 digit or less, no letters can be added. Please don’t send a request with just one # or the same # for all 3 choices. Numbers will be reserved on a first come first serve basis, so we must have alternate numbers in case your first pick has already been submitted by another racer. You can click on the “Season Number Availability” link below to see the numbers that are available in your race division. We will try to approve requests every couple days to keep this list current. If you don’t immediately get your confirmation email, please be patient and don’t send in another request. If there is a problem with your first request you receive an email back asking for a resolution. The following racers have the rights to the numbers below based on their overall finishing position in their division from the 2018 race season. If you are one of these racers it is not mandatory to run these numbers, if you would like to run another number just let us know on your reservation form. If you are moving up a division, example: from peewee bike to youth bike or youth bike to adult bike, you cannot carry your overall number with you. This is just for those of you that are staying in the same division to defend your overall position. The following numbers are not available to any other racer even if the racers below choose a different race #. Once this window opens, select bike# availability on the drop down menu & select your appropriate division to see available numbers. Remember you must give us 3 different options, in case someone has already selected your 1st choice. Please keep in mind, although you don’t see a number on this list already reserved, someone could have already submitted their reservation for the number and it hasn’t been processed yet. Please follow the directions & complete all information fields.